This no-mayo potato salad is packed with peppers. Early fall yields a rainbow of pepper fruit at the farmers market – sweet bells, cherries, hungarian, fresnos, jalapanos and poblanos – it’s impossible not to scoop up a bag’s worth of these beauties simply for their colors and impossible shapes. The trick is to find all sorts of ways to put them to use. Here is one – this peppery potato salad. The key ingredient in this salad (aside from the peppers and potatoes!) is white balsamic vinegar which lends a gentle fruity acidity. Do not substitute traditional balsamic vinegar as its dark color and syrupy consistency will overwhelm the salad. Use, instead, a high quality white wine vinegar and add 1 teaspoon of sugar to the salad. A little spice is nice! Mix up the peppers to your taste, adding a combination of sweet and hot peppers. Serves 6 to 8. Quarter the potatoes and place in a large pot. Cover with cold water and add 2 teaspoons salt. Bring to a boil and cook until the potatoes are tender, 15 to 20 minutes. Drain and cool 5 minutes. Transfer to a large bowl and add the vinegar, 2 tablespoons oil, the mustard, 1 teaspoon salt, the black pepper, and chili flakes. Stir to combine, breaking up any large chunks of potatoes, and let stand at room temperature until lukewarm, about 30 minutes. Add the 1/4 cup olive oil and the remaining ingredients. Stir to thoroughly combine, and taste for seasoning. You may want to add a little more salt or a pinch of sugar, depending on the sweetness of the peppers. Cover the bowl with plastic wrap and refrigerate for at least 1 hour to allow the flavors to develop. Serve chilled or at room temperature. We love no-mayo potato salads in our house. Looks great! What a incredible salad that captures the delight of the current season! 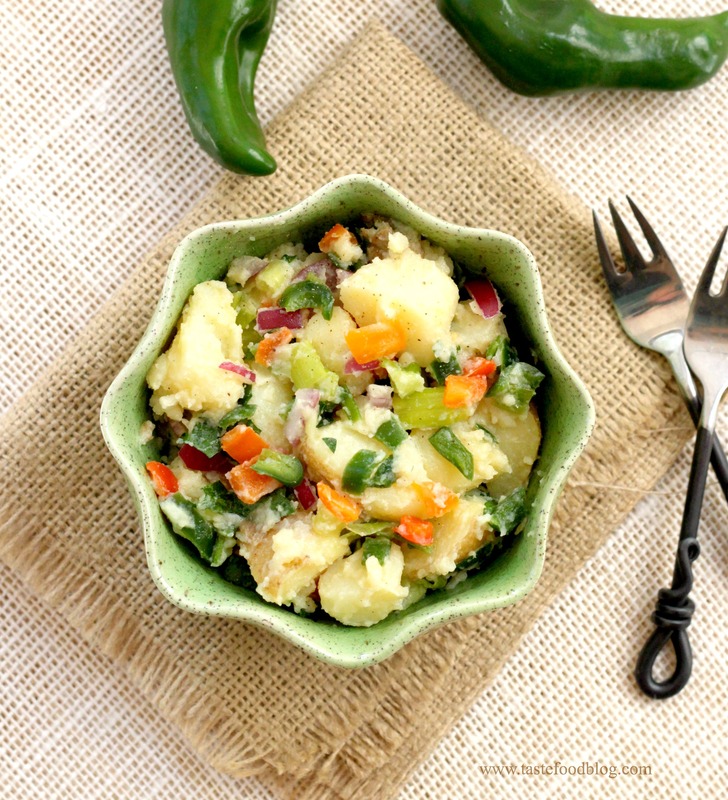 The vibrant colors of the peppers are framed by the creamy potatoes, marvelous! I love potato salads without mayo! And I’ve been looking for some ways to use my white balsamic vinegar. This is perfect! I haven’t made potato salad in ages and now I’m inspired! What a wonderful variation with vinegar and peppers – love the spicy kick. Potato salad is a classic dish that I will always love! 🙂 Like the peppers!